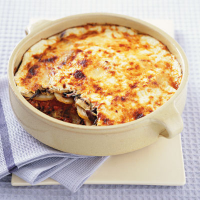 A hearty vegetarian dish of aubergines and potatoes, layered with a herby tomato sauce and topped with Italian cheese. Perfect winter fare. Preheat the oven to 200°C, gas mark 6. Place the potatoes in a pan, just cover with cold water and bring to the boil for 5-7 minutes, or until almost cooked. Drain and leave to cool slightly. Meanwhile, heat 1 tablespoon of the oil in a medium pan and cook the onion and garlic for 3-4 minutes until softened, then stir in the cinnamon, if using, and the chopped tomatoes. Simmer uncovered for 15 minutes until the mixture has thickened. Season to taste. Heat a griddle or frying pan, brush the aubergine slices with the remaining oil and cook for 2-3 minutes each side in batches. Arrange half the potato in the bottom of a 1.5-litre shallow ovenproof dish and place half the aubergine on top. Cover with the tomato sauce and half the cheese. Top with the remaining potatoes and aubergines. Mix together the fromage frais and egg then spoon over the top. Sprinkle with the remaining cheese . Bake for 35 minutes, or until golden brown and piping hot. Serve with a fresh cucumber and rocket salad, dressed with a little balsamic vinegar. This dish can be assembled the day before, covered and kept in the fridge until ready to bake. If you cannot find Castelli cheese, you can substitute any hard Italian cheese, such as Parmigiano Reggiano or Grana Padano (but these may not be vegetarian).